As a real estate appraiser serving the Texas panhandle for over 35 years, I’ve gained deep insights into what earns a property a higher appraisal. But a higher appraisal isn't the only deal. Sales price and speed of sale are also important. 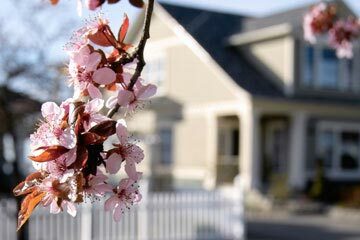 While shrubs and a new tree WON'T raise your appraised value, it can make all the difference when it comes to how fast your home sells or justifying the asking price. Wouldn't you like an easier sale? Landscaping isn’t just your front lawn, it’s essentially anything outside your home: trees, decks, fire pits, swimming pools, patios, etc. Maintaining these items properly boosts the property’s curb appeal—that first impression that instantly wows prospective buyers. Homes with attractive exteriors command higher prices and typically get scooped off the market faster. Lots of landscaping is easy to maintain and can provide extra benefits to the homeowner. Cacti native to Texas, for example, require less water and attention than other plants and give your property a unique flair. Strategically placed trees can shade your home from the sweltering Texas sun, lowering energy bills significantly. KEEP IN MIND: While you won't get a higher appraised value from a few cosmetic changes, you might get more value from having lots of old trees or more sophisticated landscaping moves, provided they're commensurate with the rest of the neighborhood. If you sink a LOT of money into your landscaping, but that puts the property far above other properties in the area, it might actually not pay off. The adjustments on comparable sales are relatively minor (maybe +/- $1000, an just one example) for superior landscaping features. You won't likely get to add $10,000 to your appraised value. But completely run down landscaping that puts the property *below* the condition of other area homes, can subtract some off the appraised price. Make wise choices. Whether you care for your landscaping yourself or hire professionals, it’s a smart move and a wise investment. Feel free to reach out to me with any appraisal questions; I’m more than happy to help by offering tips, discussing your options, or setting up an appraisal in the Texas panhandle region.